We’ve seen many different uses for propane in Brampton. The most common uses are for forklifts and backyard BBQs, but one use that is becoming more and more common is propane generators. Most people remember generators as large, noisy, smoke-billowing diesel engines that keep the power on when the electricity goes out, but, just like every other type of engine technology, there are new, greener ways to provide temporary power and propane generators are one of them. Propane doesn’t go bad. Properly stored liquid propane has an endless shelf life, unlike gasoline, which can spoil or become stale after about 1 year. That makes propane a smart fuel choice for people who don’t know if or when they will ever need to fire up their generator. Safer storage. Propane is safer to store and transport than gas or diesel fuel. Propane cylinders are almost impossible to damage and they very rarely spill or leak. Obtaining propane during an extended power outage may be easier than finding gas, especially if the electric gas pumps are down. Better for infrequent use. One of the biggest hassles of using backup gas or diesel generators is dealing with the gummy deposits the fuel leaves behind in the engine. Since propane burns so cleanly, there is very little residue left behind to gum up the engine, which means the engine will be easier to start even after extended periods of non-use. Clean burning. Propane is far less polluting than gas or diesel and produces less carbon monoxide. You still shouldn’t run propane generators indoors, but at least you can take comfort in knowing that you’re doing less damage to the environment with a propane generator. Duel-Fuel options. Some propane generators run on either propane or gas, making them more versatile and giving consumers a chance to try out a propane powered machine without giving up their gas-powered machine to do so. We’re intrigued by propane-powered generators and will definitely be keeping an eye on new models as they hit the market. 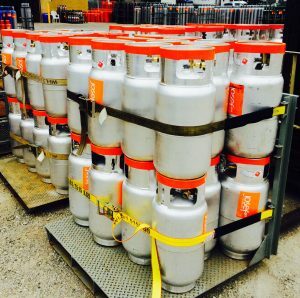 For those who already have propane-powered generators and need a reliable supplier of propane in Brampton, contact Josef Gas at 416.658.1212 or visit us online at www.josefgases.com to learn more about our propane services.